Whether you consider yourself tech-savvy or a technophobe, in today’s world, technology touches virtually everybody’s lives in one way or another. It’s an industry that comprises hundreds of thousands of companies and is worth trillions of dollars worldwide. 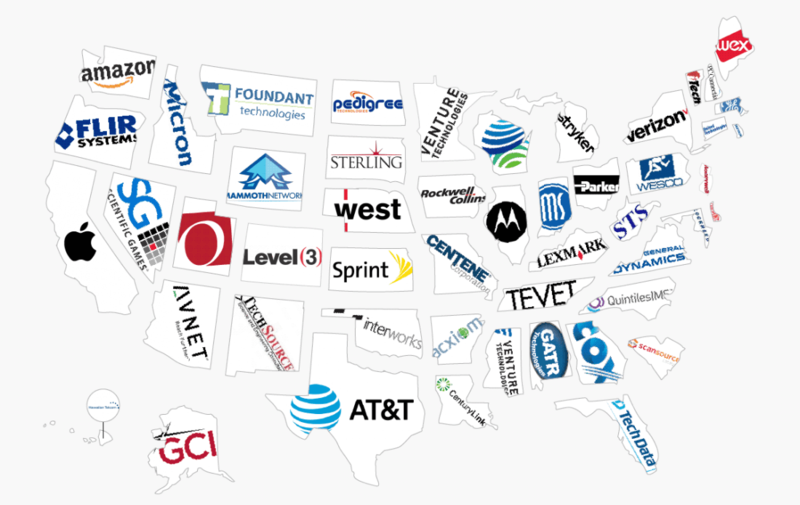 Now, thanks to data solutions company Utopia, you can find out which is the biggest tech firm in each US state. The data is based on company revenues listed on the 2016 Fortune 1000 list. For the lesser populated states, the Inc. 5000, which ranks the country’s top 5000 fastest-growing private companies, is used. As you can see from the breakdown infographic by Business Insider, there are huge differences between the revenues of the biggest companies in each state. It’s no surprise to see that Apple, the largest company in the world, is also the biggest firm in California. It recorded a revenue of $215 billion in 2016 and has 115,000 employees. Whereas Montana’s largest tech firm is Foundant Technologies, an online software service platform, which made $4 million in 2015 and has just 43 workers. Despite its size, Apple doesn’t sit at the top of the pile when it comes to largest number of employees. That distinction goes to General Electric (a tech firm is defined here as a company that describes themselves as developing new technology in communications, IT software, healthcare, aviation, or data solutions). The Boston-based conglomerate is Massachusetts’ largest tech company, with 330,000 workers and a revenue of $123.7 billion last year. It’s noted that five of the biggest firms on the list - Apple, General Electric, AT&T, Verizon, and Amazon (Washington’s largest tech company) – generate a combined revenue of over $764.5 billion and employ a total of 1.113 million people in the US. Make sure to check out the full details at Utopia's website, which also shows the second-largest tech companies in each state.